Conference venue: Centre de recherches mathématiques, Pavillon Andre-Aisenstadt, Université de Montréal, 2920, ch. de la Tour, Room 6214. There will be a reception after the lectures on Monday, August 16 in Salon Maurice-L'abbé, Pavillon André-Aisenstadt (Room 6245). Finding 'nice & compact' presentations of various groups has been a subject of great interest for groups theorists for more than a century. Well known presentations are the Coxeter presentation of the finite symmetric groups and Steinberg presentation of groups of Lie type. 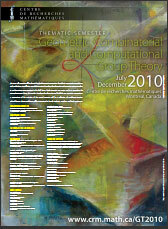 In response to conjectures of Babai and Szemeredi on one hand (motivated by questions in computational group theory) and of Mann on the other hand (motivated by questions on subgroup growth) we show that all non-abelian finite simple groups (with the possible exception of Ree groups) have presentations which are small (bounded number of relations) and short (w.r.t the length of the relations). This is very surprizing as the simple abelian groups - the cyclic groups of prime order - do not have such presentations! We will describe the motivations and results, a cohomological application (proving a conjecture of Holt) and some connections with discrete subgroups of Lie groups and topology. 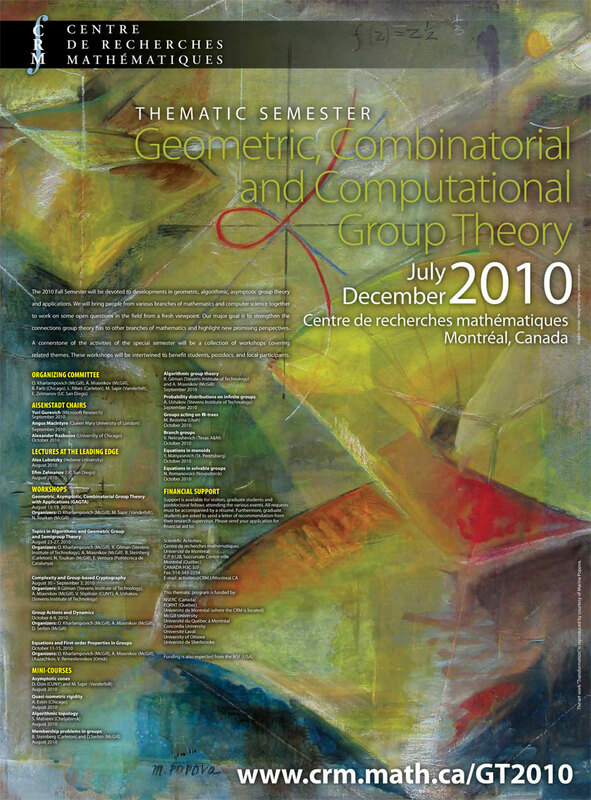 (J. of the AMS 2008, GGD 2008 and Euro. J Math. - à paraître). The sieve methods are classical methods in number theory. Inspired by the 'affine sieve method' developed by Sarnak, Bourgain, Gamburd and others, as well as by works of Rivin and Kowalsky, we develop in a systemtic way a 'sieve method' for group theory. This method is especially useful for groups with 'property tau'. Hence the recent results of Breuillard-Green-Tao, Pyber-Szabo, Varju and Salehi-Golsefidy are very useful and enables one to apply them for linear groups. We will present the method and some of its applications to linear groups and to the mapping class groups. (Joint work with Chen Meiri - en préparation). We will discuss recent efforts to apply geometric methods to infinite dimensional algebras and their representations.